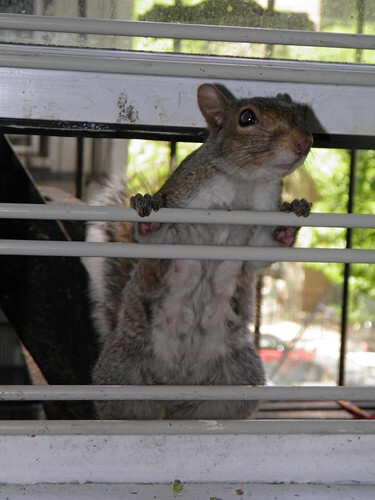 The last time cheeky wild Mommy Squirrel came inside my apartment and somehow got Mickey, the squirrel recovering from a malocclusion, to bust out of her cage, there was some question as to why I didn’t get pictures. At the time, it seemed like an emergency. Today I left the office for two minutes and came back to find Mommy Squirrel in my chair. So I grabbed the camera to see what Mickey would do. She came out and deliberately ate in front of Mommy Squirrel, but then seemingly ignored her. My dog Jolly would do give dogs who barked at him a kind of I can’t see you kind of nonchalance. I hope it’s not any kind of Mickey’s disability that she actually can’t see the invading squirrel. I suspect Mickey is like my mom: she only pretends to be oblivious, but is on top of everything going on.